This new music is available on on major channels, including ITUNES, SPOTIFY, AMAZON, TIDAL, YOUTUBE MUSIC, for streaming, download or purchase of a physical CD. "Antarayaami – Knower of All Hearts" by Nina Rao offers the practice of chanting born from her South Indian roots and influenced by her many years of chanting in the USA. This 12-track double-CD of call-and-response kirtan and Hanuman Chalisa melodies including a duet with Grammy-nominated new age artist, Krishna Das, blends the sacred sounds of traditional eastern tabla, dholak, harmonium, kartals, bansuri flute, esraj, and sarod with Western electric bass, violin, guitar and banjo, and soulful vocals. This album draws from the rich heritage of devotional music and chanting style from India and is still rendered accessible for all to sing along with. See the complete liner notes here. This CD contains never-before-heard Chaleesas featuring Krishna Das, Jai Uttal, Nina Rao, Trevor Hall, Govind Das and Radha, Shyama Chapin, Raghu Markus, Salman Lee and Patrick "Habib" Lee, and Johnno Ryan with the Taos Temple Chaleesa Band! This beautiful compilation CD includes a Chaleesa chant sheet. This professional audio track was recorded live during the Ram Dass mala ceremony at the Open Your Heart in Paradise Retreat in Maui, Hawaii in December 2015. The chanting holds this sacred space for all and seals the teachings received during the retreat into everyones wide open hearts. During this session, each retreatant greets Ram Dass personally, receives a mala with a thread from Maharaj-ji Neem Karoli Baba’s blanket, and visits the altar that graces the 5-day retreat. During this session and while the greeting is happening, Krishna Das and Nina Rao lead the group in chanting the mantra 'Sri Ram Jai Ram Jai Jai Ram’ accompanied musically by the band. At the end arti (waving sacred lamp lights) is offered to the images of all the saints and deities presiding over the retreat. It starts with Krishna Das singing Hanuman Stawan and if you listen carefully you will hear the arti bell followed by Krishna Das singing Jaya Jagadeesha Hare. You will hear some of the instruments dropping out toward the end as the musicians leave the stage to each get their malas from Ram Dass - but the chant keeps on. We hope that this continuous chanting of the sacred mantra will help you to deepen your own chanting practice at home; your car; wherever; or be the sound track for your asana practice. This SRI RAM KIRTAN SADHANA is available for $4 on Krishna Das Music. Krishna Das (vocals & kartals), Nina Rao (vocals & kartals), Arjun Bruggeman (tabla), Mark Gorman (bass), David Nichtern (guitar), Genevieve Walker (violin). Recorded and mixed by Kevin D. Reilly. *mp3 track length: 1 hour 38 minutes. Mantras of the Sun is inspired by the twelve mantras that correspond with the Sun Salutation (Surya Namaskar) asana sequence. These mantras offer a powerful sonic level to the physical practice and also stand on their own as a unique and profound mantra practice, particularly relevant for the 21st century. For yoga practitioners, Mantras of the Sun features three different versions of the Sun Salutation mantras as well as an extended play track for use during asana practice. Woven around these core mantras, the album also contains traditional opening, closing, and bija mantras of the sun. Available on Amazon, iTunes , CD Baby, and Mantrology. Krishna Das has been singing the Hanuman Chalisa for over thirty years, and on Flow of Grace he takes us deep into the heart of this powerful prayer to Hanuman, the embodiment of devotion, service, strength, and compassion. Krishna Das' deep, hypnotic voice is steeped in love as he sings five entrancing melodies of the Chalisa, as well as a beautiful version of the prayer by Nina Rao. More information about the release on Krishna Das Music. Kirtan!" is a live chant album featuring kirtan artists Ambika Cooper, Devadas, Jeremy Frindel, Lily Cushman, Nina Rao, and Shyama Chapin. Recorded in 2012 at the Brooklyn Yoga School, this CD captures the beauty and power of a chant community that has been gathering each week in Brooklyn for many years. Each kirtan wallah offers their distinct sound and style to the mantras, while pulling from the traditional call and response melodies of India. Released by Vanaras Music. "Brooklyn Mellows" is the fifth studio album from innovative kirtan artist and producer, Devadas. The record is inspired by "Vrindavan Mellows," a little known recording from Aindra Prabhu that blends live kirtan recordings with the ambient sounds of India. Devadas follows suit with "Brooklyn Mellows", weaving together his chants with the sonic sphere of Brooklyn, NY. 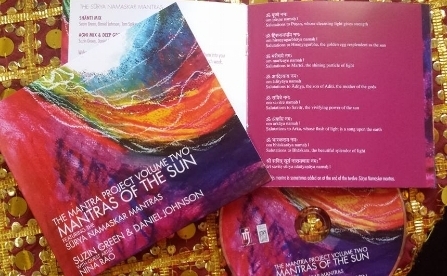 The double-disc CD features fellow kirtan artist Nina Rao, as well as their daughter, Uma Rao-Labrecque. Released by Mantralogy. Enjoy these unique recordings that capture the powerful practice of call-and-repsonse chanting. These simple recordings were made on phones or other portable recording devices, but hold within them the beautiful moments of devotion and energy.